Home / How to help? Have information to give? Who to contact? If you have any information you can contact the following. •18001 101 (text phone) – If you are deaf, hard of hearing or speech impaired. •07786 220 022 (SMS) – If you are deaf, hard of hearing or speech impaired. 0800 555 111 To give information to Crimestoppers anonymously. As well as calling crimestoppers anonymously on you can also give information anonymously online. The information will be sent to crimestoppers over a secure internet connection which makes sure that you, and your computer, cannot be traced. There call handlers read what you have sent them and will take out any information that might identify you, before forwarding it to the relevant authorities. If you have some information or think you may have some information and don’t want to approach the police directly you can contact me, I will respond to you as soon as i receive your message and can forward your information to them on your behalf. 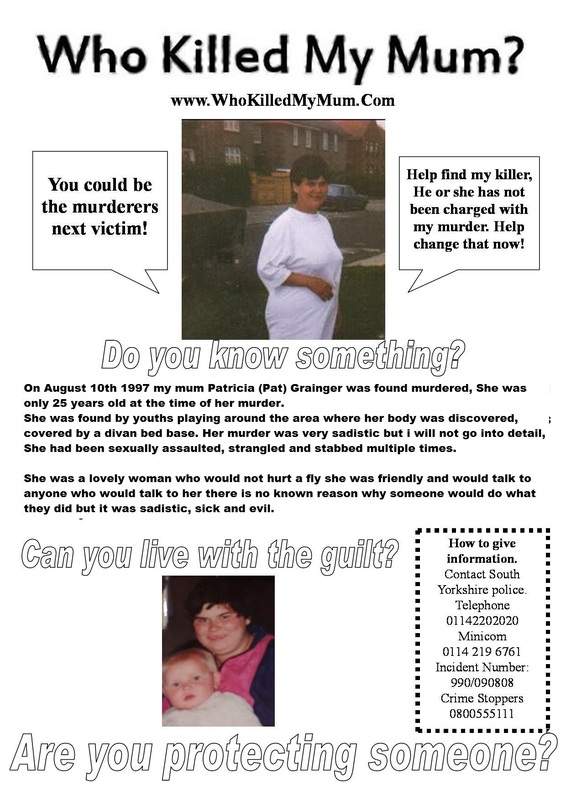 Any information you have no matter how small could be vital to solving this and getting justice for my mum so please don’t hesitate to send me a message. If you wish to link to this website please click here. You can also help by placing a poster/flyer in your shop/business window or in your place of work staffroom ect or anywhere you can think of to download my flyer/poster please click here, Thank you.